THE FARTHEST SHORE (Le Guin) & THE OLD MAN AND THE SEA (Hemingway) | Weighing a pig doesn't fatten it. Just like A Wizard Of Earthsea, one of my absolute favorite pieces of writing, this last book in the original trilogy is a Bildungsroman. This time the focus is on Arren, a prince who is destined to become the new king – something the reader picks up rather quickly. In this installment, Sparrowhawk, the trilogy’s returning character, has become old and obviously wise, and acts as a mentor for Arren, unlocking his true potential. There is a curse on the land too, resulting in people forgetting their powers. A bit like in The Buried Giant now that I think about it – yet another essay that will remain unwritten. I think this is the weakest book of the three. The prose doesn’t seem to shine as much – reading the first book was a treat on a sentence by sentence level. Not that the writing is bad here, but there’s a noticeable gap with what came before: I didn’t feel the need to write down even one quote. This seems to be the most didactic of the three volumes, but fails at inner consistency. Sparrowhawk, in his role as Archmage, has to instruct the youngling, and what we get is familiar stuff about balance and the likes. But Le Guin doesn’t seem to be able to make up her mind. Evil is a “web we men weave”. Twenty pages further, Sparrowhawk says evil is born out of a hunger for power over life, greed, swaying “the balance of the world”. On the same page, dragons are called “avaricious, insatiable, treacherous; without pity, without remorse.” But still, Sparrowhawk can’t answer the question whether dragons are evil. “Who am I to judge the acts of dragons? . . . They are wiser than men are.” That’s a whole lot of mess for any student of ethics. That same passage continues with the familiar trope of being vs. doing. “It is with them as with dreams, Arren. We men dream dreams, we work magic, we do good, we do evil. The dragons do not dream. They are dreams. They do not work magic: it is their substance, their being. They do not do: they are.” Sentences like these are easily written, but their content is underdeveloped. Dragons do stuff in the book, crucial stuff. Why they transcend the good-evil dichtomy is never explained. How their magic differs from Sparrowhawk’s is never explored. It is philosophical fantasy’s version of science fiction’s handwavium. While scifi’s knowledge most of the time doesn’t reside in the specifics of the technicality, in this kind of fantasy the life lessons transmitted depend on a solid foundation, or they become mere catchphrases. There is merit in Le Guin’s Taoism and whatever school of thought that spurs contemplation and acceptance, but the entire being vs. doing trope seems to be born out of a trick language plays. It seems clever and deep to make a dichotomy of these two verbs. It seems clever because it’s fun: both verbs are among the few auxiliary verbs we have and as such take up a central place in our linguistic minds, both verbs are very short, 2 sounds only, and as an ing-form they even rhyme. So yes, it appeals to the nursery rhyme part of our mind and that tricks our slow brain into perceiving depth, but a dichotomy they are not. There’s simply no doing without being, and no being without doing. Part of this is a matter of taste, surely, and simplifications indeed can have didactic value, but I think there are better ways than language games to promote acceptance, mindfulness, what have you. Moreover, and more crucially, simplicities such as these obfuscate: they substitute insights gained from praxis for superficial slogans. Such slogans might show the way for the uninitiated, true that, but they are not the destination itself. Similarly, Le Guin gets tangled in the messy web that is free will. Crucial parts of the book are devoted to advocating the fact that people should only do what they must do, what they need to do. This inner necessity guiding The Farthest Shore‘s characters is indeed an apt description of what guides us all: we are all the result of causal processes, as are all our actions. As such, the destinity of Arren – and with him so much of literature’s and myths’ other characters – is a metaphor for determinism. And the prophecies in countless similar stories are ultimately a celebration of science: our ability to make predictions increases whenever our scientific understanding advances. The problem is that Le Guin can’t put her finger on the nature of choice, just as I hinted at in my review of The Tombs Of Atuan. So she advocates acceptance, and being over doing, but nevertheless stresses the importance of making the right choice and discipline. You can’t have your cake and eat it, I’d say. I’m waiting for the publication of a major fantasy work that does exactly this: acknowledging the true reality of destiny, and sidestepping the moral matrix without the need to infuse its readers nor characters with the Importance of Being Right, but instead offering guidance on how to work with destiny and propose Tools to Become Better. A Wizard Of Earthsea‘s moral message was much more powerful, much less elaborate. In The Farthest Shore, Le Guin tries to cram in too much, and because of that, makes a mess out of it. I will not elaborate on yet another greatest hit of Deep Writing: death being necessary for life – no light without the dark, yin and yang, etc. The Farthest Shore is more episodic than both predecessors, and at times has a bit of a random, disjointed feel. Especially the climactic confrontation and the answer to the story’s mystery seems to come out of nowhere, depriving the principal antagonist of any depth. As such, what could have been a highly emotional ending for this part of the series, sadly happens in an emotional vacuum. The fact that Arren often resembles a stock character doesn’t help either. While A Wizard was indeed a gem, The Farthest Shore is more of a conglomerate, often solid, but some parts porous and brittle, yet other parts vapid, and, luckily, there’s some specks of crystal here and there. I’m still curious about book 4, Tehanu, written and published much later, in 1990. Did 17 years of additional experience add to Le Guin’s power of weaving words into spells of both knowledge and entertainment? Spectacular beginning, but as the novella progresses it becomes more and more transparent and predictable. I think Hemingway did a great job describing a simple, poor man at the end of his life, but went a bit off the rails trying to inject message and heroism. Although this is based for a large part on a true story, it is clearly allegorical too – and not difficult to grasp, as it’s still part of high school curricula. The Romantic/existential/Christian pathos didn’t fully work for me, as I’m not sure Hemingway has something interesting to say about the condition humaine, except for stuff already said countless of times. That content in itself would not have been a problem, if the form would have been less obvious. I can see why it gained the status it has in post-WW2 America, and the book definitely has enduring qualities, but in a way it’s rather simplistic in its approach to Man’s relation to Nature and to Life. One could say there’s not much more to be expected from such a short work, but there’s more complexity in some of Kafka’s one page short stories. Well, no need to compare, this still stands pretty well on its own. 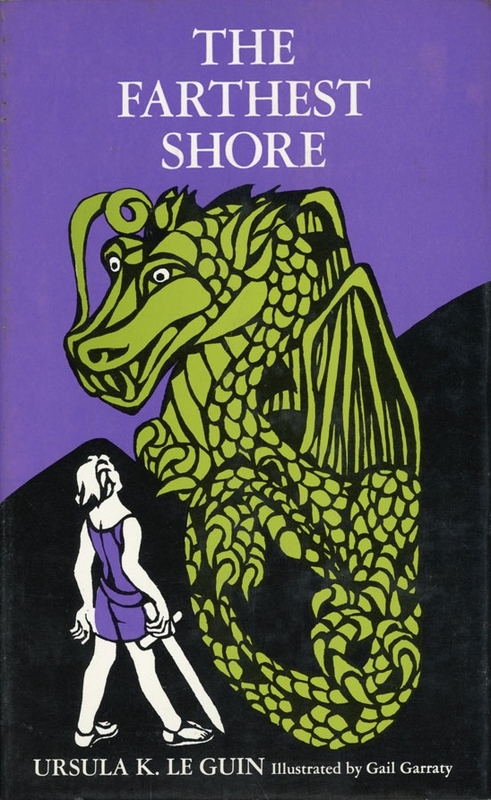 This entry was posted in Reviews and tagged 1950s, 1970s, Ernest Hemingway, Fantasy, Non-SFF fiction, Review, The Earthsea Cycle, The Earthsea Quartet, The Farthest Shore, The Old Man And The Sea, Ursula Le Guin. Bookmark the permalink. Interesting critical take! I thought I was done reading Le Guin, but this makes me interested in those Earthsea sequels. Especially the second is still excellent, with a surprising voice of its own. This one has merit too, and as it’s about a travel/quest, it is a bit vignette-like, going through different atmospheres, keeping things fairly interesting. Yes, for all of Le Guin’s Tao acceptance promotion, she is indeed quite negative about humans, imo failing to see we are just animals as well, and that animals can be greedy, violent, etc. just as us: there’s examples enough of other animals destroying their own habitat. I guess in the 60-70ies the Nature-Humanity dichotomy was still way stronger in biology. Morris, Goodall, De Waal still needed to do their work to really break things open. I think the dragons are the stronger point here, although they are underdeveloped, so your remark kinda makes me look forward to Tehanu. I think I will end up reading all 6 eventually. The Other Wind is a high point for me in the further part of the Earthsea cycle – it seems a deal better organized intellectually and emotionally than the surprisingly juvenile third part and the undeservedly bitter fourth. Yet, for all the misgivings I have for Tehanu as a novel it works quite well as an ideological piece – it is a strong voice in the anti-paternalistic, anti-xenophobic discourse, all the more needed now. I’m curious what your thoughts will be on it! When I first read this, Bart, way back when, I thought it unbalanced in structure, though never minded all the philosophical musings–they came across as well-meaning without me worrying whether they were consistent or had an internal logic. Third time around I wondered if the structure was as much influenced by Le Guin’s desire to explore the southern and western reaches of Earthsea (where earlier instalments were concerned with the east and the centre) as with taking her story to a conclusion. Again, the criticisms you levy here–and they seem perfectly valid to me now–weren’t at all uppermost in mind, and I’m not so sure they’d niggle me on any subsequent read. I’d be more concerned, I think, with whether character motivations were convincing. Still, a thought-provoking post, thanks! Interesting perspective! I think I experienced a bit of what you call unbalanced structure too – the other mage coming from nowhere might be called a structural issue, and there were some other similar issues, albeit not as important as that mage. On the other hand, I also kind of liked the episodic nature and Le Guin’s courage not to introduce everything at lenght. Sometimes I wish I wasn’t so programmed to read for philosophical consistency – it can take out the joy of ‘just’ reading at times. On the other hand, it’s a bit of a fun intellectual game too, so I do enjoy it. Not sure about character motivations. It didn’t strike me as a problem, at least not Ged’s, nor Arren’s – I particularly thought the part where he lost faith in Ged was daring and well done. What did you have in mind? I don’t have high hopes. Good to dimish it further: by now Tehanu can only be better as expected. When I read it for the first time back in highschool I was expecting more of the trilogy. What I got was something so different and so bitter and angry that my teenself couldn’t believe it was the same author. Now that I’ve read a couple of other things by Le Guin I tend to think Tehanu is more her style and that the original trilogy was a fluke. Agreed, especially the first two stand out among her oeuvre, as everything else I’ve read by her is rather preachy and messagy. I’m actually quite surprised by the status she has in the speculative community, but I think part of the answer lies in the veneer of seriousness she offers, being the daughter of an anthroplogist, and also in the fact that reading her practically amounts to a kind of virtue signaling. I’ve reviewed her so called political masterpiece, The Dispossessed, and all I could think was ‘meh’, this isn’t complex or nuanced at all. I definitely need to read Le Guin’s A Wizard Of Earthsea but I do love the sound of The Farthest Shore. 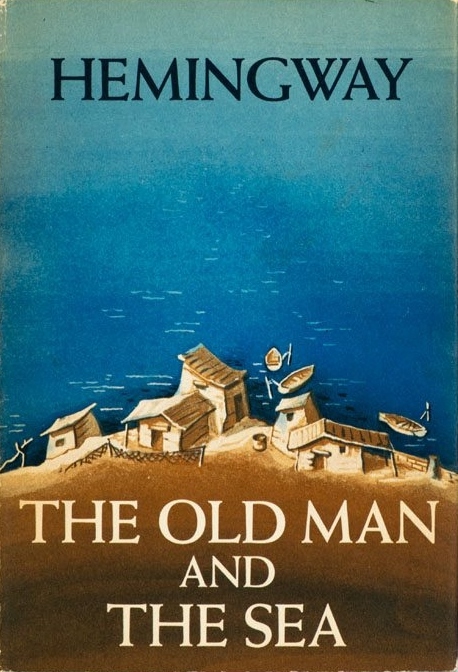 I also need to read The Old Man and the Sea. While you saw it simplistic, I’m still curious to discover the allegory and its historical relevancy. Fantastic reviews and thanks for putting these back on my radar. Thanks for the kind words, much appreciated! Do read A Wizard first – based on that you’ll probably want to continue the series, so you might end up on The Farthest Shore someday. The Old Man is definetly still word reading, despite being quite transparant indeed – it’s a very quick read, under 100 pages, big print, a short novella by today’s standards.